Enjoy a day trip from Singapore to Hello Kitty Town Malaysia and enjoy the comforts of a chartered bus on your journey. Once in Malaysia, discover the fun and frolic of the Hello Kitty Town and indulge in a childhood adventure with Hello Kitty and her friends. Explore the Sanrio Hello Kitty Town and discover the magical land of Hello Kitty. Enjoy meet-n-greets, live performances and playful rides at the Hello Kitty Town which features up to 10 different attractions. Create your own souvenirs to take back and indulge in many fascinating journeys including ‘Hello Kitty in Oz’ and more. Relax in the comfort of a shared chartered bus on your way to and from Hello Kitty Town. An absolutely perfect family day out, the Hello Kitty Town in Malaysia is the best bonding activity for all members of the family. Spend a day with your loved one as you go into a different country and visit one of Malaysia’s top entertainment theme parks. The best part, we’ve got your transportation sorted all the from Singapore and back. Just sit back, relax and dive into a world of fun. Once you’ve exhausted yourself, don’t worry about the journey back. Our coach picks you up right from the Hello Kitty Town parking lot and get you back to Singapore. Hello Kitty Town is one of Malaysia’s top theme parks for children. But, it also offers activities for the entire family. Just sit back and relax as you make your way to this fantasy theme park and take in the breathtaking journey across international boundaries. Once you’ve reached Hello Kitty Town it’s time for the fun to begin. Dive into the fabulous world of Hello Kitty and see the magic all around you. Venture into the mystical land of Oz on an adventure with Hello Kitty and discover a story of bravery and friendship. Explore the house of Hello Kitty and watch her along with her friends put on a special performance for you. 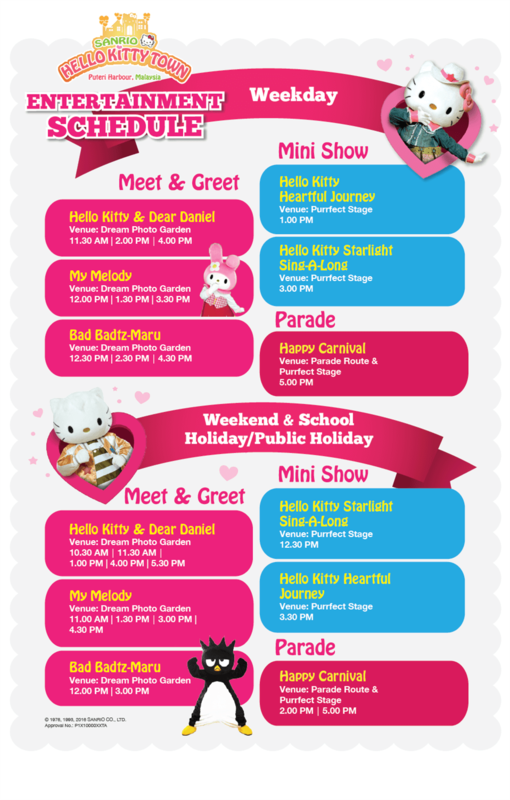 Check out the daily entertainment schedule at Hello Kitty Town to best plan your day. Children aged 0-2 will not be charged. However, if the child is taller than 90 cm please carry an identity proof to avail the free entry. Pickups from/drop offs at Singapore will be at Singapore Flyer and Big Box Jurong East. Two buses ply the route each day. The buses will leave from Singapore Flyer at 09:00 am and 10:30 am; the bus will leave from Big Box Jurong East from 09:30 am and 11:00 am. Please arrive at the boarding point 15 minutes before scheduled departure. The buses will leave from the Hello Kitty Town Coach Bay at 05:00 pm and 06:30 pm. Please arrive at the boarding point 15 minutes before scheduled departure. All travellers, including infants, need a minimum passport validity of 6 months to leave Singapore. Carrying your original passport is compulsory. • You will receive an email with your Hello Kitty Town and transfers voucher. No need to print. • If you choose to board at Singapore Flyer, please proceed to Travel and Transit Hub, unit #01-06D, facing the carpark and look for the WTS Travel Counter. Swap your e-voucher for a redemption voucher which will state your bus details. • If you choose to board at Big Box Jurong East, proceed to the Main entrance opposite Ng Teng Fong Hospital located near the taxi stand. Swap your e-voucher for a redemption voucher which will state your bus details. • Once you reach Hello Kitty Town, present the mobile voucher along with your passport at the entrance ticketing counter and swap your e-voucher for your paper tickets. • Your tickets are valid only for the date and time you’ve selected.